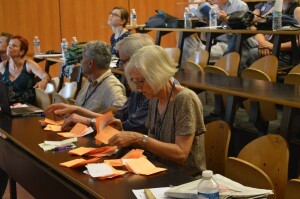 At each EuroSLA conference, an Annual General Meeting (AGM) of EuroSLA members is held. The AGM elects the executive committee, decides on changes to the EuroSLA constitution, and hears reports from the EuroSLA president, treasurer etc. An important feature of each AGM is information concerning upcoming EuroSLA conferences.